I’m so proud of myself!! I made bread with yeast and it actually came out as a loaf of successful, delicious bread. I’ve been scared of yeast since I started cooking years ago. I mean, yes I’ve made pizza dough and homemade pretzels. But bread? 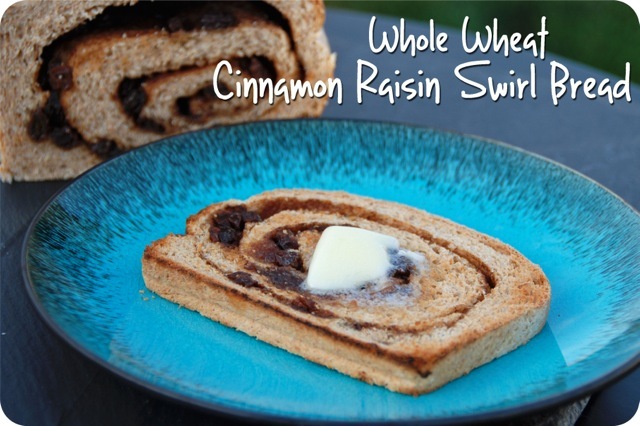 Doesn’t bread take finesse and superior culinary skillz and… well, SRC: Whole Wheat Cinnamon Raisin Swirl Breadturns out it really just takes yeast. It’s not a scary ingredient after all, and doesn’t require any more cooking knowledge than reading a recipe. Wahoo! This month, for Secret Recipe Club, I was assigned Renee’s blog Kudos Kitchen. I was in awe over Renee’s bread recipes. She has a TON of them, but some of my favorites were the Rustic Olive Bread and Poppy & Sesame Seed Challah Bread. I’ve been eating a ton of cinnamon raisin English muffins lately, so I was totally inspired by her Buttermilk Cinnamon Sugar Raisin Bread. Renee is a wife, mom to 2 sons and 4 furbabies, and based on looking through her blog– an awesome cook! She also likes art and her blog is super cute and colorful. I couldn’t wait to try her bread recipe! In a large bowl, dissolve the yeast in the warm water. Stir in the sugar and allow the yeast to sit 10 minutes, until foamy. 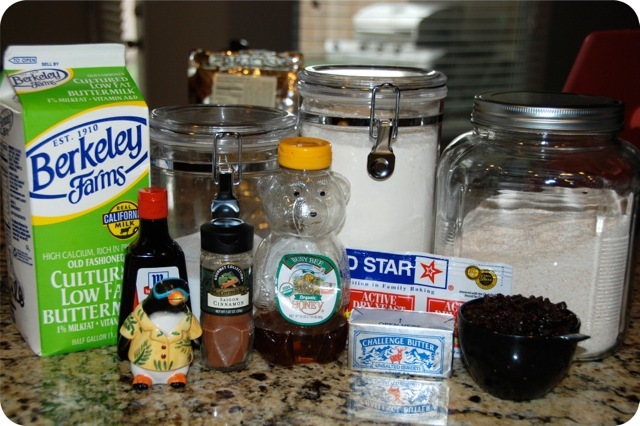 Stir the cooled melted butter, honey, vanilla extract and buttermilk into the yeast mixture. Add the flour and salt to the bowl of a stand mixer with the dough hook attached (or in a large bowl with a wooden spoon). Slowly, on a low speed, add the yeast mixture into the flour and continue to mix (or knead by hand) until a soft smooth, non-sticky dough forms (you may need to add additional flour depending on your weather conditions). Continue mixing or kneading for about 7 minutes. Once risen, roll the dough out on a floured surface to form a 16 x 9-inch rectangle. Brush melted butter on the dough. 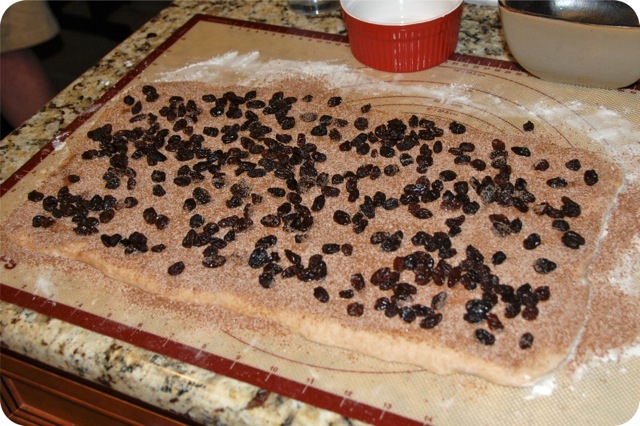 Sprinkle sugar, cinnamon and raisins evenly over the dough. 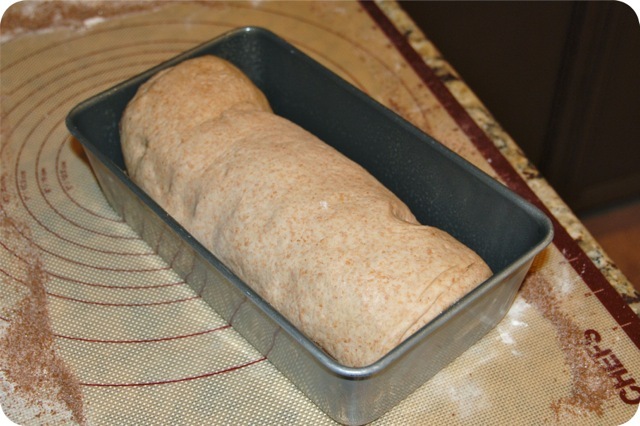 Starting at the narrow end, carefully roll the dough to form a tight log. Place the log in a buttered loaf pan (seam-side down) and let rise an additional hour in the pan. Bake for approximately 35-40 minutes or until it is nicely golden brown and sounds hollow when tapped. 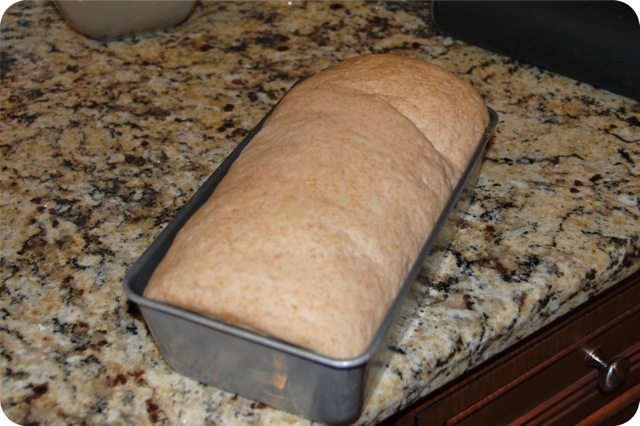 Cool on a wire rack for about 15 minutes then remove the loaf from the pan to cool completely before slicing. The bread came out great and has inspired me to try some other yeast breads too. I always thought you needed a breadmaker or something fancy… but nope. Just an oven! Thanks, Renee! I LOVE homemade bread, it’s one of the few things I miss since discovering I’m gluten intolerant and had to give it up. I still make it for the rest of my family, talk about torture! 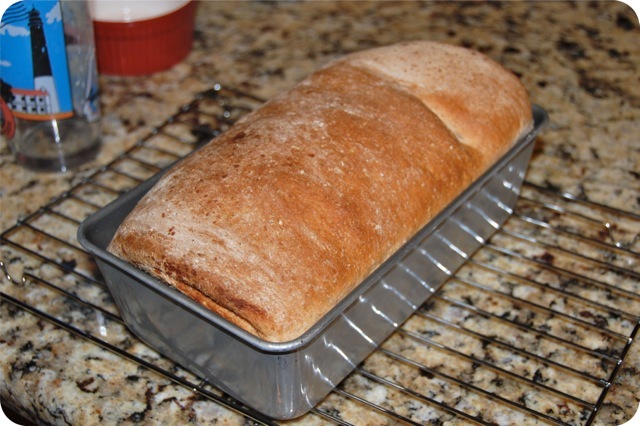 Your bread turned out beautifully, cinnamon raisin was a favorite of my mom’s for breakfast. Yea for bread! Congratulations! 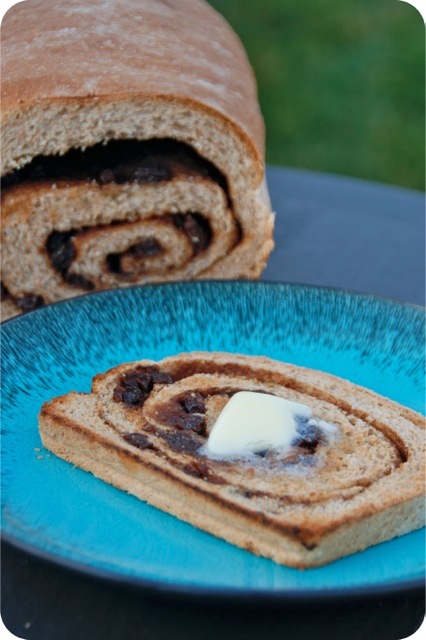 Your cinnamon raisin bread looks amazing. Well done on your inaugural loaf of yeast bread! First I want a big slice with butter, and then I want your aqua plate, too! Too much to ask for? I’m so glad I inspired to you try your hand at yeast bread. From the looks of your loaf, you’re a natural!!! I’ll bet you’re as hooked as I am now! LOL You did my recipe proud. Thanks, and happy reveal day!!! You did wonderful! Now I am sure you exorcize all your bread and yeast demons! That looks so GOOD!! I have been wanting to bake a loaf of cinnamon raisin swirl bread forever and just haven’t done it yet. I really must give it a try – happy SRC Reveal Day!! I always love the SRC posts! It’s always neat to see what kinds of recipes you get from other people and how they turn out. I’ve never made bread before. Like you, I’m intimidated! My parents had a bread machine when I was younger, but I always thought it was stupid. (And loud, really loud.) Now I think it’d be kind of fun to have one. Looks beautiful. Glad you are getting more comfortable with yeast! Making bread is one of my favorite things. Congratulations on your first real loaf of bread!! I love baking bread. I find it so therapeutic. Your loaf looks amazing. This looks SO amazing! I’d love a slice for breakfast tomorrow with a big ol pat of butter. YUM! That looks so good! I have yet to try making a swirl bread before. I’ve tried a 100% Whole Wheat Cinnamon Bread before but it was blah…this sounds like it would be way better with the addition of all purpose. Look forward to giving it a try! Great SRC pick!